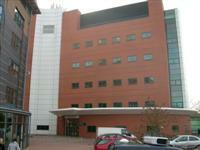 Services / facilities within the building include the Department of Molecular and Cell Biology. 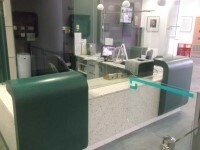 This is a secure building, which cannot be accessed by the general public. 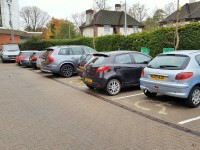 The car park can be used by staff and Blue Badge holders. 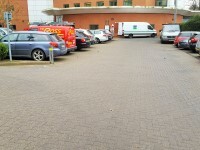 The dimensions of the designated parking bay(s) are 350cm x 460cm (11ft 6in x 15ft 1in). The nearest designated bay is 32m (34yd 2ft) from the main entrance. 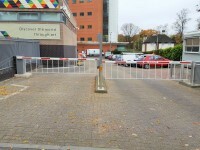 Access to this car park is via Security Controlled barriers, shown in photograph 3. 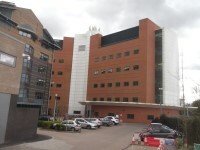 There are also 4 Blue Badge bays at the top end of the CRF car park, close to this building. 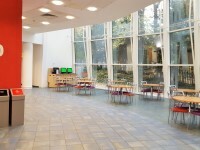 Henry Wellcome Reception is located ahead and on the right as you enter. 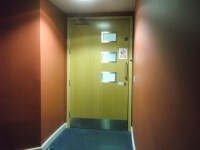 The lift is located at the rear of the foyer. 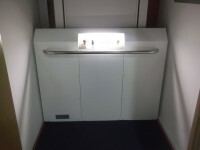 The dimensions of the lift are 135cm x 95cm (4ft 5in x 3ft 1in). 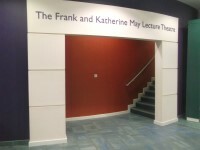 You are on Lecture Theatre(s) (The Frank and Katherine May Lecture Theatre). Skip to the next section. 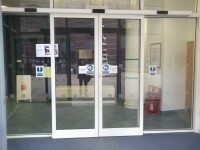 There is not step free access into the lecture theatre(s). 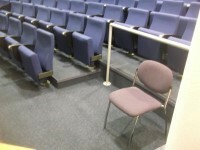 There is/are 8 medium (11cm-17cm) step(s) for access to the lecture theatre(s). 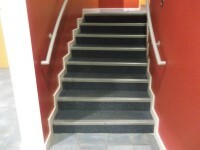 The step(s) is/are clearly marked and has/have handrails on both sides. 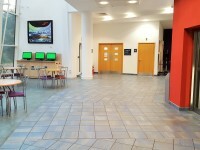 The designated spaces for wheelchairs users are located at the front and at the back. 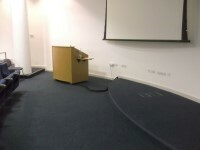 There is a hearing assistance system for the lecture theatre(s). Floor coverings in the lecture theatre(s) are not even. 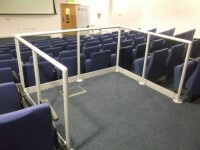 Step free access to the front of this lecture theatre is available on request. 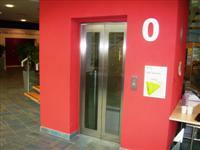 You are on Lift (Lecture Theatre). Skip to the next section. 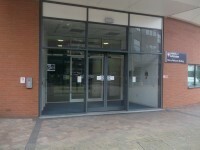 The lift is located on the left as you face the theatre entrance. 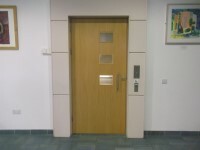 The dimensions of the lift are 95cm x 140cm (3ft 1in x 4ft 7in). 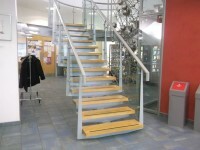 At either side of the entrance to the lecture theatre is a set of 8 medium steps with handrails on both sides. 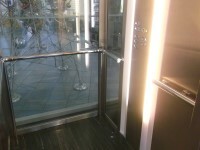 The platform lift overcomes the steps. You are on Accessible Toilet (Cafe Welcome). Skip to the next section. 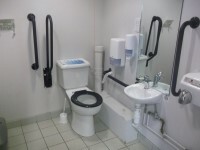 This accessible toilet is located on the left of Cafe Welcome. 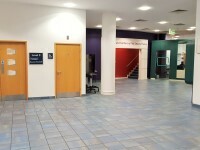 There are similar accessible toilets on all floors There is an additional accessible toilet located at the side of the lecture theatre. 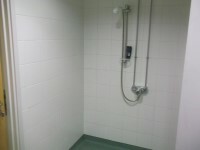 The dimensions of the accessible toilet are 265cm x 200cm (8ft 8in x 6ft 7in). This accessible toilet also has a wheel in shower. You are on Accessible Toilet.. Skip to the next section. 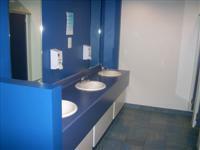 This accessible toilet is 19m (20yd 2ft) from the main entrance. 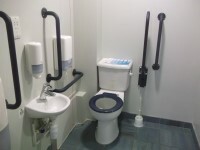 The dimensions of the accessible toilet are 154cm x 200cm (5ft 1in x 6ft 7in). The toilet surveyed is located past the lift in the ground floor foyer. 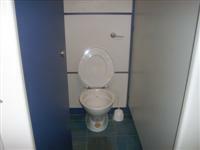 The standard toilet surveyed is approximately 28m from the main entrance.